Every once in a while, we get a clear view of a major disconnect in the Republican Brain.This certainly is true with the responses of many GOP office-holders to the recent tragic crash of an Amtrak train in Philadelphia. In terms of what happened, the train was going 106 mph in a 50 mph zone with a tight curve, as it headed north to New York.The train derailed, leading cars to fall apart and tumble down inclines. Of the 238 passengers and 5 crew on board, 8 were killed and over 200 injured, 11 critically. It has still not been determined if the cause of the crash was human error by the engineer, mechanical failure of existing equipment, or even the remote possibility that a projectile hit the engine window and disoriented the engineer. 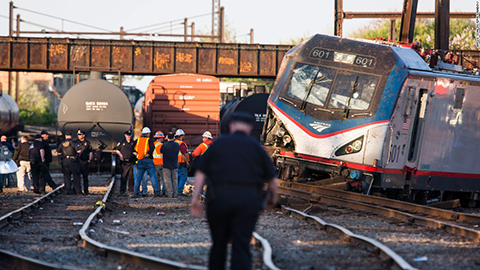 Officials of the National Transportation Safety Board said that the crash might have been prevented by a computerized, speed-limiting system called Positive Train Control (PTC) that was operational elsewhere on the Northeast corridor. Amtrak’s budget has been repeatedly cut by GOP lawmakers. Boehner is missing the obvious. Had more money been appropriated to Amtrak, it would likely have been spent it on installing PTC in that stretch of track.This action was already in Amtrak’s budget for 2015, and with a few more dollars, they could have completed this work much earlier, as well as many other necessary safety projects. Boehner was not alone in his stance. Rep. Bill Shuster (R-PA), chairman of the House Transportation and Infrastructure Committee, which has oversight of Amtrak, said the crash “did not have anything to do with money.” His committee that bottled up requests for increased Amtrak spending on safety. Rep. John Mica (R-FL) took it considerably further, saying that opening the commuter rail market to private investment was the solution to what he called a “third-world rail system …. run in a Soviet-style operation.” His memory seems to fail him. For years, passenger train service was in the private sector (with considerable government assistance). When airline business boomed in the second half of the twentieth century, passenger service plummeted. Yet, in certain areas of the country, particularly the northeast corridor from Washington, DC to Boston, demand was still high. One only needs to drive from Washington to Boston to be convinced that it is good policy to have alternate forms of transportation that can take cars off the roads. That route is the bread and butter of Amtrak. For it to be sustainable, it must be safe. Train fares alone do not provide that money for Amtrak. Since its inception. it has had federal subsides (as the private railroads previously had). It is in the national interest to keep Amtrak solvent, which means a combination of sales revenue and federal subsidies to make it safe, convenient, and effective. Republicans can laugh all the way to the bank as they continue to pour government largesse upon our largest corporations, particularly in the financial industry. But for them to not see the connection between government assistance and safe rail service is not just poor public policy, it is a window into the curious and often malicious Republican brain.